Tea lovers unite and add the Greenport Tea Company to your list of places to stop when shopping in Greenport, Long Island. Once a tea lover, always a tea lover and Greenport Tea Company has everything that you need to enjoy a great cup of tea. 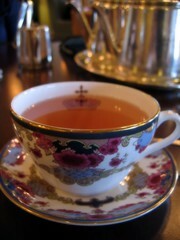 Zagat calls them the “gem” of an afternoon tearoom and says they bring a “touch of England” to the bay. This is easy to do since one of the owners came from England and knows how to serve a great cup to tea. The shelves of the Greenport Tea Company are filled with over 50 jars of tea, all dedicated to the pleasure of steeping and drinking first-rate loose-leaf tea. They even have a dessert tea called Sweet Endings, which was blended by the owners and has scents of caramel, chocolate, and vanilla. Perhaps you may wish to have a little lemon curd or enjoy High Tea for two? Once you have tried their tea and returned home, fear not! They offer on-line shopping on their website and you can replenish your supply of tea or enhance your tea brewing accessories. At any time during the year, but especially during the winter months, this is a delightful way to spend an afternoon in Greenport on the North Fork of Long Island. We at Arbor View House also serve tea in the afternoon for our guests. Come join us here and at the Greenport Tea Company.